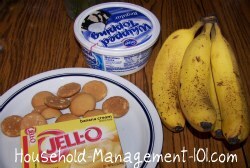 Here is my family's easy banana pudding recipe, with vanilla wafers and chunks of real banana. We love to eat it on holidays or for a special treat. I grew up eating southern banana pudding at family picnics and other special occasions, but my mother never made it so I didn't learn how as a kid. One year my family couldn't go to Thanksgiving with the rest of the family and the kids and I were sad we wouldn't have our annual taste of this pudding as part of our dessert. That's why I finally figured out how to make it, and to my suprise, this version is quite easy. It has become one of our favorite Thanksgiving recipes. There are some people in my family that make their pudding from scratch, and I have to admit their recipes taste really good. But I started with a mix because I have no idea how to make it from scratch. My family couldn't taste the difference though, so I think I'll stick with this easy version. Some boxes of banana pudding mix have a recipe for banana pudding with vanilla wafers on the side, but frankly my recipe is a little different than the ones I read, so I'm sharing it here. * I have a name brand mix pictured, but that is just because the store was out of the generic brand when I went. I have previously used 2 small packages of generic mix instead, and it tasted the same. ** Make sure to use the amount of milk it says on your brand of pudding mix, since I've found this can vary between brands. First, make the pudding like it says on the package, using your mixer to beat it all together. Then, let it sit for a couple of minutes to set up and get thick. While it is setting up slice your bananas. In addition, layer the bottom of a large bowl with a layer of vanilla wafers and then a layer of sliced bananas. 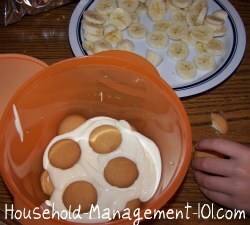 That is one of the differences between my recipe and some of the box recipes for vanilla wafer banana pudding. 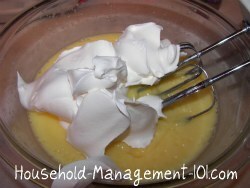 In those recipes it sometimes just says to layer the whipped cream or toppings between the layers. I've found it tasts a lot better to actually combine the whipped topping in the pudding for a much creamier taste. Next, just take your pudding and whipped topping mixture and put a layer of it on top of the wafers and bananas. Then, just add more layers (see picture to the right). Let your kids do the layers, if they want, because it doesn't have to be perfect (no one sees them) and at least my kids think it is really fun. One tip about the bananas though is to make sure they all get completely covered with pudding, because otherwise if they stay exposed to air too long they can start to turn brown. When you get to the top layer just use the rest of your whipped topping to make a thin layer on top, and then cover with one more layer of vanilla wafers. My family likes the wafers to get a little soggy in the pudding, because then they crumble up into the pudding some. However, if you or any of your family or friends like a little crunch just make sure to reserve some fresh wafers to serve with it on the side, so they can mix them in right before they eat it. 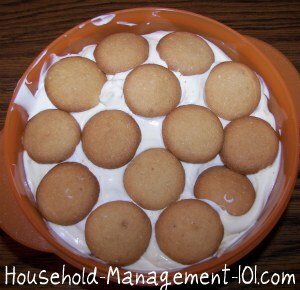 I'm not really sure of the exact number of servings in this easy banana pudding recipe, but it is made for a big family or a family gathering. If you just want a little you should definitely half the recipe.